The time had come to re-pot my plants in to "larger digs" from the cute little pots that I had made when I bought them. All they had at our local store was boring plastic planters. 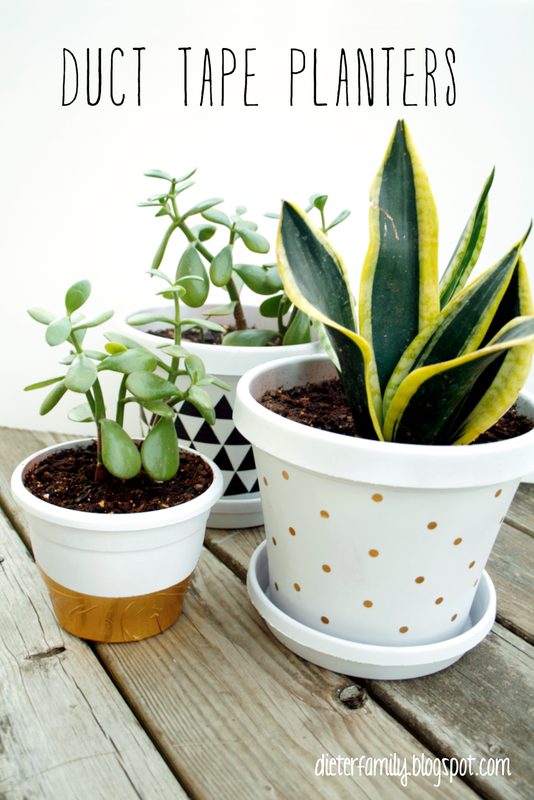 So with a little spray paint and Duct tape this super easy DIY was done. First I painted all of the pots white with Krylon spray paint, let them dry, and then re-potted my plants. For the decoration I used gold Duct tape, a hole punch, wax paper, black Duct tape sheet (super cool product! ), and scissors. For the polka dots, place a small amount of the gold Duct tape on the wax paper and then use the hole punch to make dots. Peal off the wax paper and stick the dots on in any pattern you wish. For the triangles, I cut the Duct tape sheet into stripes and then using the grid on the back I cut my triangles. The grid is super helpful in keeping everything the same size. Place the tape on the pots in any pattern you wish. I did mine in straight lines, but random would look nice as well. For the smallish planter I just used a piece of the gold Duct tape on the bottom for a dipped look. Super easy project and doesn't take as long as paint or markers. I had not worked with Duct tape before and had no idea it came in so many colors and patterns. There might be a few more uses for the gold Duct tape in future projects!